When crossing the road, you tend to look into the eyes of the driver of the nearest car, right? Of course you do - you want to make sure he or she has seen you and intends to stop. But what if the car in question is autonomous, and what if the "driver" is taking a nap? How can you be sure that the car has seen you and won't suddenly decide to run you over? Easy, you wait for the smile. 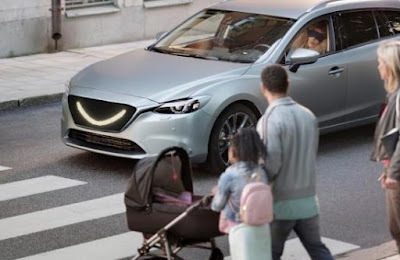 For a start, we're still exceptionally creeped out by the sight of someone sleeping in their autonomous car (like this time), and the fact that the car's lights give it a serious facial expression, only serves to make us suspicious. Also, notice the way it drops the smile when the pedestrians pass in front, like it was just faking being happy! Alarm. Bells. Ringing. Still, this is answering the question of what if you can't establish eye contact with the driver of a car, which will increasingly be the case now that self-driving cars are taking to the streets in growing numbers. We'd just hate to see the car get angry. You wouldn't like it when its angry.